When I first heard of the so-called \'Capcom Five\' -- five titles (now four -- one of the games got axed) developed and published by Capcom \'exclusively\' for the Gamecube -- I thought this game had the most unfortunate name out of all of them. I mean, Product Number 03? Even Viewtiful Joe has a better name than that -- \'viewtiful\' might not be a word, but at least it\'s quirky (and oh-so-Japanese). And, to make it more awkward, the main character in P.N.03 is named Vanessa Z. Schneider. Um...okay. I don\'t have a problem with the name Vanessa or anything (so don\'t send hate mail if your name is Vanessa, alright?). It just seems a bit out of place. Actually, one could argue that in this day and age of free-roaming, do-anything, non-linear Grand Theft Auto 3-era game design, a simple title like P.N.03 is indeed out of place. To me, it\'s like a game from another era, just with better aesthetics. You know what, though? That suits me just fine. Besides, just because a game is simple doesn\'t mean that it\'s bad. 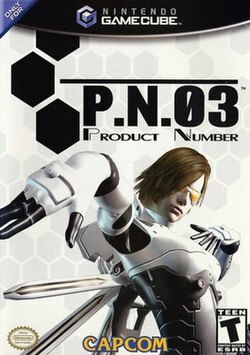 P.N.03 is a straight 3D shooter. There are no puzzles to solve, other than the odd laser trap you must get past. However, there are tons of robots to destroy in order to progress in the game. The entire game takes place in the future, on a distant planet that must have been colonized by humans at some point in time (the game never really clues you in on the history of the place). The CAMS, or Computer Arms Management System (basically automated weapons systems), were built by the colonists to act as a defense mechanism to protect the huge base on the planet. Oh, yeah, apparently these CAMS killed main character Vanessa\'s parents in the past, too, but she seems to have moved on in her life. You see, Vanessa\'s a mercenary, and she\'s been hired by a very secretive client to go to this colonized planet, kill all the CAMS there, and explore the planetary complex. That\'s basically the thrust of the very simple story. There is a twist at the end, but it doesn\'t amount to much. This is a shooter, after all, so the plot is more an excuse to play through the game than anything else. Okay, as far as the setting goes, this game is not varied. The base you\'re inside of for most of the game is almost universally colored white (except for a few gray and silver areas) and very streamlined in design. There are lots of curved, shiny surfaces, and many of the rooms repeat. The exterior environments are usually wind-swept, brown-colored desert areas with some small buildings on the horizon. Personally, I think they are rendered well for what they are, and there are some nice particle effects in the desert stages. This game doesn\'t really need sophisticated level designs, so I don\'t think they detract from the gameplay very much. The characters, however, are well done. The CAMS are nicely modeled and quite varied in appearance, but they\'re also sparsely animated. Thank God the bosses are more interesting to look at. Vanessa herself is another story, though. Her character is well designed and animated, and her specialized combat suits (called Aegis Suits) are nice, as well. Her most unique attribute in the game is that she dances as she fights and explores. Even when standing still, she clicks her fingers and taps her feet to a musical beat only she can hear. When she dodges enemy fire, she spins and flips about until her robot foes run through their patterns. Then she exterminates them with her suit\'s palm shot. Needless to say, this game\'s full of stylized action, and Vanessa is so smoothly animated that it is fun to simply watch someone play the game. Without a doubt, Capcom created a very cool character in this game. With the dancing aspects in the game, you might think the controls are hard to get used to. Personally, I found the control scheme to be quite intuitive and easy to learn, but a little on the touchy side. Also, if you want to truly master the game, you must master the controls, which takes time and practice. Some of the controls are similar to the Resident Evil series: Vanessa can\'t turn on a dime while she runs, and there\'s a quick 180-degree turn-around button, for example. That\'s where the similarities end, however: Vanessa\'s dodging maneuvers are done by pressing the left and right shoulder buttons, while the face buttons handle the shooting, jumping, and crouching actions. You also use the Directional pad in conjunction with the face buttons to utilize special moves called Energy Drives. These attacks are not hard to pull off, and are more powerful than Vanessa\'s standard shot, but they are limited by an energy bar which you must recharge by collecting orbs in the game. Overall, I admit there were a few times when I wished the controls were a bit tighter, especially in certain combat situations, but I\'m pleased with them overall. Apart from the controls, the game itself is difficult. Frustratingly so, at times. I mean, if you\'re a gaming novice, or didn\'t grow up playing games like Ninja Gaiden and Contra: Hard Corps, you\'re probably going to walk away from this one fast. Enemies are quick, tenacious, and have stronger attacks than Vanessa does, so you have to think quickly if you want to survive the game. The boss battles are incredibly relentless and tough-as-nails. Some of their attacks seem nigh-impossible to dodge, but once you get a lock on their patterns and a suitably high-powered Aegis Suit, getting past them is much easier. It\'s a hard game, but not so challenging that you\'ll want to run away in disgust. Sound is one area in which this game truly excels. The game\'s soundtrack is purely techno, which really fits the futuristic science-fiction setting (and Vanessa\'s dancing) well. Even though the music is good, it can get repetitive in the long run, as most electronic music does. Some tracks are, in fact, used twice, but I never found myself getting so annoyed that I reached for the volume button on my stereo system. Aside from the music, there is actually a miniscule amount of voice acting in the game. While most mission briefings are done in text without voice, later in the game there are a couple of cinemas where Vanessa speaks. She is played by Jennifer Hale, a veteran voice actress who has had roles in many videogames and animated series (she recently played Bastila in Star Wars: Knights of the Old Republic). She does a remarkable job here, even with the small amount of lines she had, so I can\'t complain about that. On a side note, it\'s funny that Capcom didn\'t do all the mission briefings in cinematic form, but I don\'t think it would\'ve added anything to the game anyway. As for the moral appropriateness of this game, I think it warrants its Teen rating from the ESRB. There is some suggestiveness in the way that Vanessa dances (she really shakes it when she\'s shooting the CAMS), and her Aegis Suits are extremely form-fitting, but not too revealing. That said, her dancing is less immoral and more acrobatic for the most part, and while you\'re playing, you barely notice her swaying hips, since you\'re too busy trying to survive. Anyone watching will see it, though, so be cautious around younger children and such. Honestly, I don\'t find the dancing in this game as offensive as some of the stuff I\'ve seen Britney Spears do in her music videos. Other than that, there were a couple of instances in the all-text briefings where the \'d\'-word was used, but those were the only instances of bad language in the game. Overall, I think P.N.03 is a solid effort from Capcom. It\'s not a big franchise name, and most of the game critics hammered it, but I thought it was a well designed throw-back to a simpler time in gaming. Back then, games were easy to learn, tough to master, and so much fun, even though many were quite difficult. Today, in the age of Grand Theft Auto and its many clones, it\'s not so much the play mechanics that matter, but the complexities of the character interaction and the story. There is a place for that, as well, but every once in a while it\'s great to see a game driven by action and starring a cool lead character like P.N.03 or Gunvalkyrie on the Xbox. Still, as much as I would like to see a sequel (to both games, I might add), I doubt there\'ll be one, not with the critical beating this game took. I hope I\'m wrong, though. Anyway, kudos to Capcom for another good game.